Photo of June Macdonald by Jerad Gallinger. Proportional representation fans have got to be disappointed this election. Less than a year after Ontario’s mixed member proportional representation referendum and with only months to go before British Columbia’s second crack at single transferable vote, hopes were high that the issue would finally come to the fore on the national stage. But in a campaign dominated by two other E’s, the economy and the environment, electoral reform has been shoved aside once again. Cue Fair Vote Canada, the nation’s most prolific advocate of proportional representation. FVC’s network of grassroots volunteers is working hard this election to spread the word on why changing the way we choose our leaders is critical to the future of Canadian democracy. As for the prospect of sweeping electoral reform being implemented in Canada in coming years, Macdonald is realistic but hopeful. 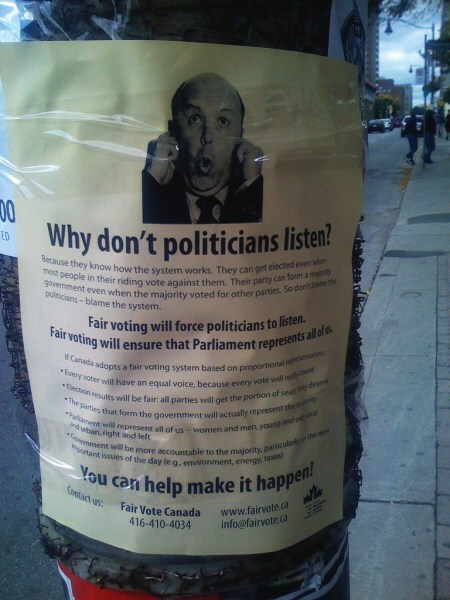 Photo of a Fair Vote Canada poster by Neal Jennings.